Where's Your Head At? Lyrics By Basement Jaxx Songs Album: Rooty Year: 2001 Where's your head at, at, at, at? Where's your head at? Where's your head at? Where's your head at, at, at, at? 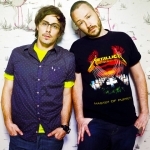 This was a huge international hit for Basement Jaxx, which is a UK dance/production duo formed in London by DJs Felix Buxton and Simon Ratcliffe. Buxton, who writes most of their lyrics, told us this song is about "Losing control and about states of anxiousness," adding, "Basically, they're the same divide between sanity and madness." The hook comes from a sample of Gary Numan's track "M.E." from his 1979 album The Pleasure Principle. Damien Peachey is the lead vocalist on this song. Never heard of him? That's typical of Basement Jaxx, who use a variety of singers - many unknown - on their tracks. And also typical, the duo adjusted the song to suit Peachey's personality. They took some time to get to know him and tweaked the words so he would be for comfortable singing them. The football (soccer) chant chorus was provided by US house DJs Erick Morillo and Junior Sanchez. The video contains a dig at the smugness of the dance music industry when a performing monkey band with human faces becomes the future of music. It was praised by Mixmag magazine as the best dance music video ever made. The video was shot over three days in a real mental hospital in Prague with some vicious monkeys. The clip was directed by the Scandinavian team Traktor and stars Damian Samuels as the ill-fated record executive. The refrain in this song started out as "Where are my dogs at?," which didn't fit the theme of the song (madness), but sounded great. Late one night, Buxton thought to himself, "Where's my head at?," and it clicked for him that the hook should be "Where's Your Head At?" "That song was like a bit of a puzzle and it kind of grew into being," he told us. This was featured in the 2001 film Lara Croft: Tomb Raider.